September is Whole Grains Month, and I am partnering with the Whole Grains Council as one of their selected "Make the Switch" bloggers. 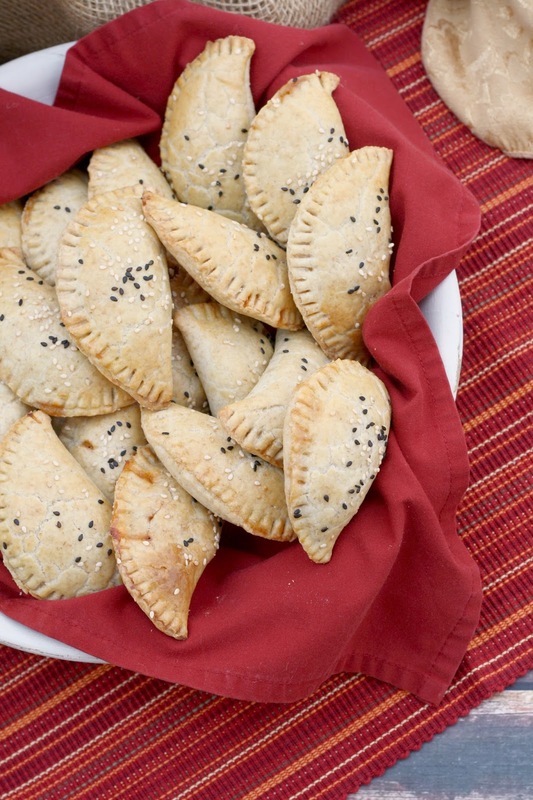 Our goal was to take a family favorite recipe and retool it by adding more whole grains. It's a contest for the participating bloggers (we can win cash prizes for the top votes), but if you drop by the Whole Grains Council website and place a vote for your favorite recipe—you'll also be entered for a chance to win cash ($500) and a big selection of whole grain foods! So, now you're wondering what I did to make the switch to whole grains, right? 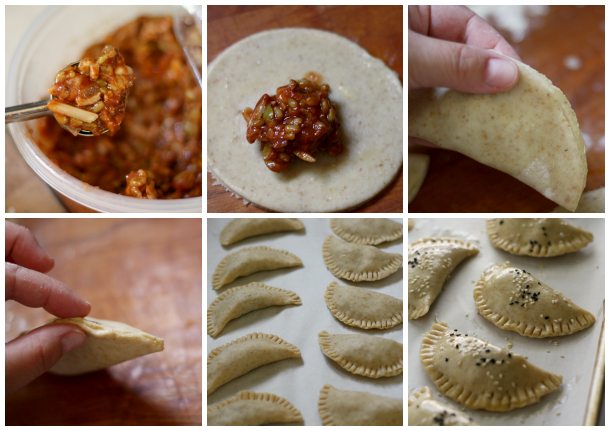 Well, I started with my family's favorite empanada recipe. The original uses only all-purpose flour, so I substituted half whole wheat pastry flour in this version. It was still flaky and tender and melt-in-your mouth delicious. I actually think it may work well using entirely whole wheat pastry flour. That was my first "switch". My second switch was in the picadillo filling itself. The original uses pork, but I switched it out for a combination of white meat chicken and farro (one of my 3 favorite whole grains). I decided to use half lean meat and half farro to make the picadillo because I wanted to ease everybody into the switch. I think I could've gone straight-up whole grain (no meat) in this instance, as well. The size and chewiness of the cooked farro really echoed the texture of our usual filling. I actually think that if they didn't already know I'd made the switch, they wouldn't have even guessed there was anything different. That's ridiculously good on so many levels. The same amazing, addictive flavor but with less fat and more vitamins, minerals, nutrients, and fiber! Maybe you're wondering what the big deal is. Why switch to whole grains? According to the Whole Grains Council, adding whole grains to your diet gives your body extra fiber, vitamins, minerals, and antioxidants-all of which are essential to good health. Eating whole grains can also significantly lower your risk of chronic diseases and illnesses like high blood pressure, stroke, diabetes, and heart disease. Plus, they help maintain a healthy body weight. Wondering how to find whole grains? Just look for the Whole Grain Stamp when grocery shopping; it guarantees that you're getting at least half a serving of whole grain. If you see the 100% banner...you guessed it...the grain in that product is all whole grain. But not all whole grains are labeled, so also keep your eyes open for whole wheat, whole rye, wild rice, brown rice, buckwheat, whole corn (popcorn! ), hulled barley, millet, quinoa, teff, amaranth, farro, and steel-cut oats—just to name a few. So, what do you think-are you ready to Make the Switch? There's no better time than the present (plus, it's Whole Grains Month...come on)! 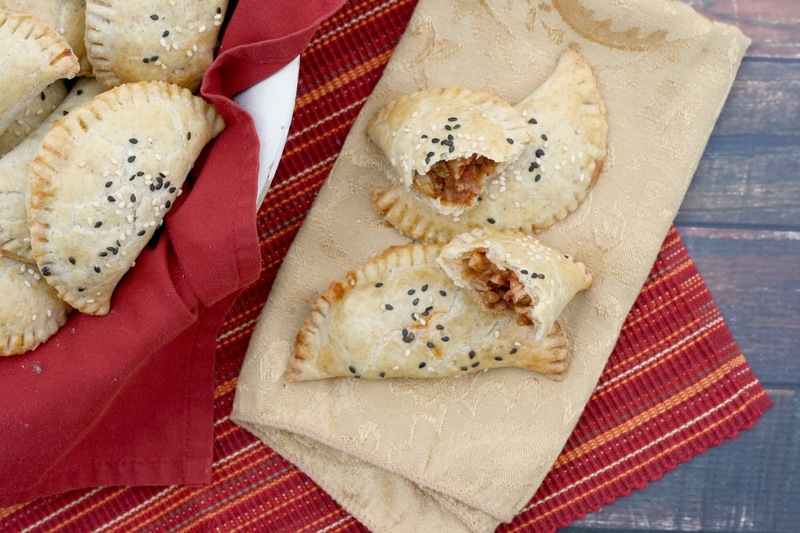 These empanadas use half whole wheat flour in the dough, and are packed with a bold white meat chicken and farro picadillo. Heat the oil in a large skillet over medium- high heat. Add onion and cook until tender, ~4 minutes. Add garlic to the pan and cook for 1 minute longer. Add meat and to the pan; cook until meat is browned through, ~5 minutes. Add the farro, strained tomatoes, broth, salt, cinnamon, cumin and cloves; bring to a boil. Reduce heat and allow to simmer gently until the mixture thickens up, ~15 minutes, stirring occasionally. Add the almonds, raisins, and olives to the pot and cook for another 5 minutes. You want the filling to be moist, but not soupy. Set aside to cool, then refrigerate until ready to use. Add the butter and cream cheese to a large bowl and beat with a mixer until smooth and creamy. Add the flours and salt and beat until just combined. Form dough into a ball, wrap in plastic, flatten into a disk, and refrigerate for at least 30 minutes, or up to 24 hours. Preheat oven to 375° F. Line a baking sheet (or several) with parchment paper. If you have two oven racks, place one in upper third of oven and one in bottom third. If you only have one, then cook one tray at a time in the middle of the oven. Cut the chilled dough in half. Working with one half of the dough at a time, roll dough out on a lightly floured work surface to 1/4-inch thickness. Cut out rounds using a 4.5-inch cutter, re-rolling and cutting as needed. Gently brush some of the beaten egg around the outside of the dough rounds. Place 1 heaping tablespoon of the picadillo in the center of each. 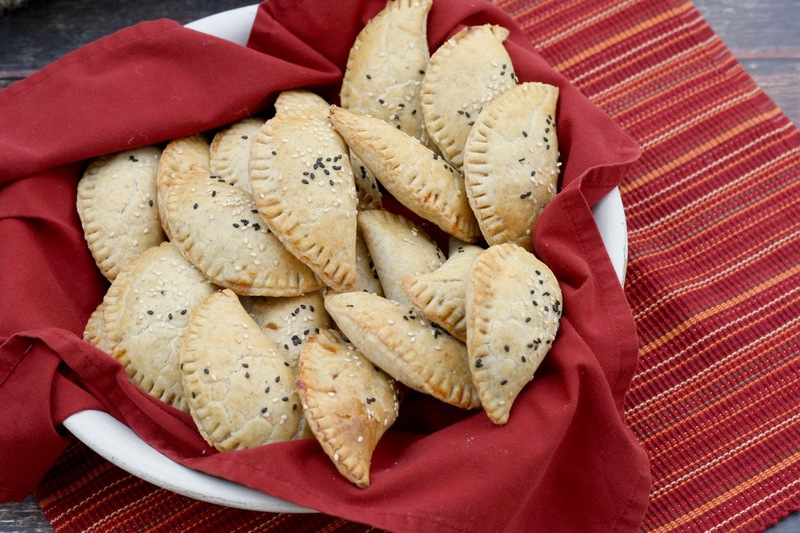 Fold dough in half, over the filling, and press the edges to seal using the tines of a fork. Transfer to prepared baking sheets and brush the tops with the beaten egg. Sprinkle with sesame seeds. Do this in batches, if need be. Slide into preheated oven and bake for 20-25 minutes, or until golden. They are great hot or at room temperature. -8 ounces of cooked farro/freekeh/wheatberries starts with approximately 1/2 cup uncooked. -When measuring the flour by volume, be sure to stir the flour around to loosen it up, then lightly scoop and dump it into your measuring cup, set over the flour container. Use a straight, flat edge to level the flour. -If you do not have a cutter that is 4.5-inches around, you can draw a circle that size on parchment paper, cut it out, and trace around it with a knife in the dough. 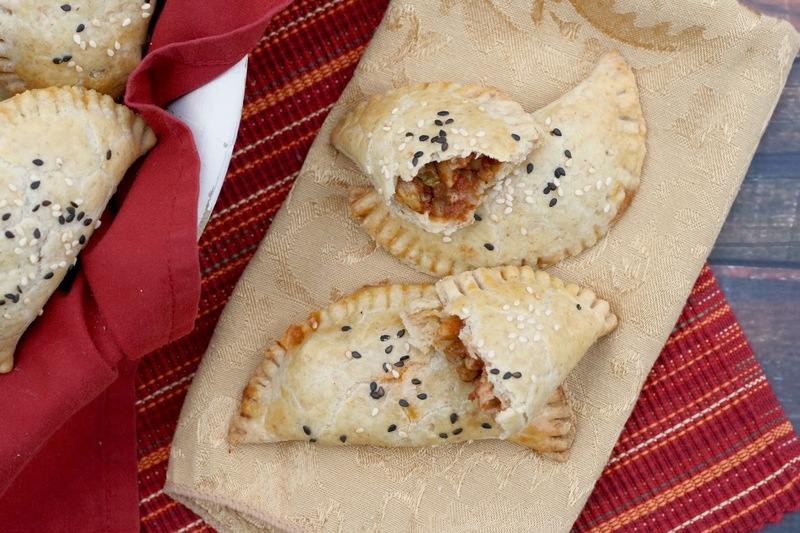 -If you want to work in advance, once you have the empanadas arranged on the baking sheet, set the sheet into the freezer until the empanadas are frozen solid. Transfer them to freezer-safe zippered baggies. When you're ready to bake them, take them out and set on a baking sheet while you preheat the oven (15-20 minutes) and then bake as directed. I received a small selection of whole grain products to sample but was not compensated for this post. All opinions are my own.